This is third of three posts. Find the first and the second. Last I was telling the story, I thought I saw snow. 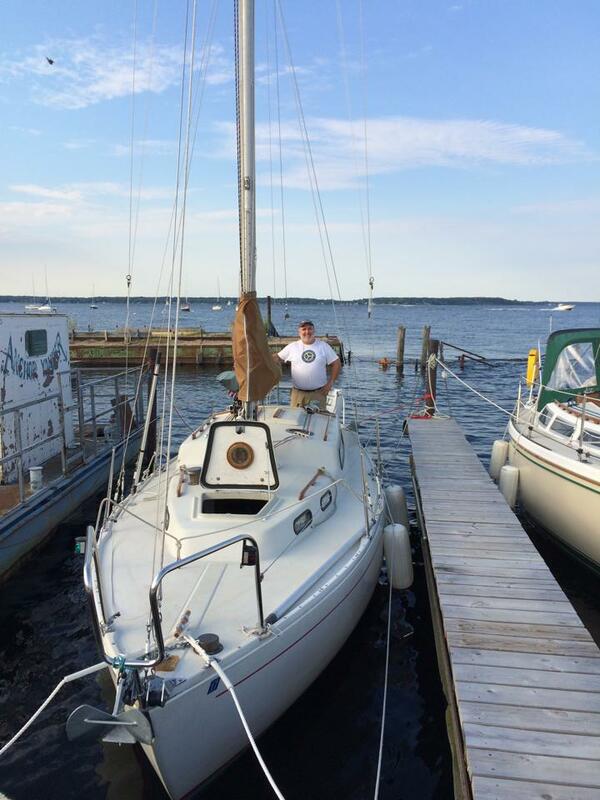 The first week of June, Dave and I were sailing across Lake Michigan bringing my boat, s/v Bella, home from Milwaukee where I had found her. It was very cold. The Mid Lake Buoy had reported 39 degree water temperature midday Tuesday. We left that afternoon and sailed all night into Wednesday morning. After dark, I had occasionally shined a flashlight at the wind vane on top of the mast. Somewhere around 3:00a, I saw little flaky things blowing across the beam of light between me and the masthead. I didn't need to see that. At all. By 5:00a or so, I figured that we were well across the northbound shipping lanes. We could rest easy that freighters were unlikely for the rest of the trip. About that time, I saw another sailboat. It was five or ten miles away, motoring south and west, a white hull and bare mast like a ghost in the moonlight. C'mon guys, I thought to myself, put some damn sail up! It was a beautiful night for a sail. The sun came up and Bella started to warm. We had most of the trip behind us. Though we were getting back into cellular range, our phones and Dave's iPad were running out of juice. I managed to text an ETA to our ground crew. Mom and Dad, and Nancy would be waiting on shore and taking lots of pictures. My optimistic ETA turned out to be wildly inaccurate, but that's sailing. Dave's iPad tracked us until its battery died. Approaching Muskegon with more than 10 hours on the tiller, my brain started playing tricks on me. The coast ran for miles and miles to the south. The far away dunes looked for all the world like a jetty sticking out into the lake. The lighter color of the shallow water along the beaches could have been the mud trail of a river emptying into the big lake. Or it might be a sand bar! I strained my eyes, hand twitching on the tiller, ready to come about at a moment's notice. Gradually, the coast came into better focus. I compared the smokestacks on the horizon with those on the chart. The GPS was locked in on the coordinates of the Muskegon jetty and it still wanted me to head a little south of east. I wasn't completely convinced but I trusted the stacks on the chart and the GPS. We sallied ... well, sailed forth. On the Michigan side of the lake, the forecast was for stronger winds, 15-20 knots, and the chance of rain. Bella was in her element. She healed over, lee rail almost in the foam and I thought heard her snort like a thoroughbred. I felt safe and dry but was concerned about handling all the lines if I had to tack in a hurry. I finally called to Dave for help; waking him. Headed more south than east with a shift of the wind, I could finally see the Muskegon jetties. We were pointing toward the beach north of the jetty but I wanted to get in close before tacking. It was going to be tricky getting up the channel. With Dave helping me sail Bella, I raised some signal flags to make a grand entrance into Muskegon. Dave called me "Captain Subtle" and teased that the drag of the flags was costing us at least a knot of forward speed. Nevertheless, Bella was decked out like a debutante and I was a proud skipper. We tacked south toward the jetty. 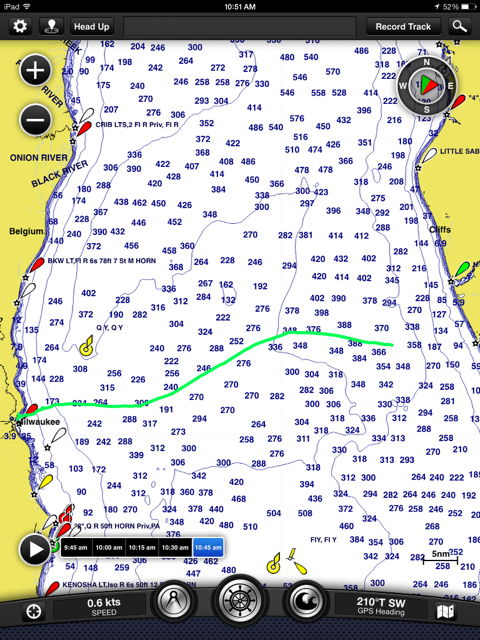 I waited as long as I could stand and we tacked in toward Muskegon but we couldn't make the channel. I'm not a racer and more than a little rusty anyway, but slicing acute angles out in the lake is hard. We sailed back to the north, then tacked down along the same track and past the entrance. I waited, waited some more, cursed myself, waited some more, and finally tacked – dammit – we missed the entrance again. Back to the north and then south again. This time closer to the end of the pier. And then I heard the securite call from the Lake Express. The Lake Express is the Milwaukee to Muskegon ferry. She was letting all stations know that she was coming into the channel at Muskegon in ten minutes. I hailed them on the radio and practiced my real-sailor-radio-etiquette. On a working channel I told them that I was the sailing vessel also approaching Muskegon but that we would stay well out of their way. Staying out of their way was a bit of a joke. The Lake Express crosses the lake in two and a half hours. We were almost 22 hours into our trip and only just approaching the coast. Worse yet, on our way out Tuesday, we had seen the ferry go into Milwaukee for the night. Here in Muskegon, Wednesday morning, she would enter the channel, cross Muskegon Lake, disembark her passengers, load again, and - dammit - leave for Milwaukee, all before we managed to enter the channel. Back on Bella, we sliced as thin as we could closer to the jetty and then way, way past. This time, tacking back, we managed to enter the outer harbor. I was amazed how close to the wind Bella could sail! At times, she was headed so close into the wind, the wind vane practically pointed in the direction we were sailing. We sliced back and forth inside the jetties; Bella was ripping. I could tell she just loved a broad reach. A broad reach is the fastest point of sail where a boat crosses the wind, rather than sails into it. Her theoretical hull speed is 6.4 knots. Dave called out when we hit 6 knots! It never felt like she was out of control. We were safe and dry and within a half a knot of her top speed. It was awesome sailing! It was raining a little too. I handed the tiller to Dave and went below to check the heading of the channel. If the wind direction out on the lake held near shore and I could get Bella pointed close to the wind on the starboard side of the channel, we could inch our way into the smaller lake. We flew back and forth across the channel entrance looking for the right tack but we could not cut it close enough. The geography of the dunes and the seawalls of the channel funneled the wind straight out into the lake. Try as we might, we could not sail right into the wind and without an engine that was it. I dropped anchor just north of the channel mouth and called for a tow. Next I had to get all those damn signal flags down. Even Captain Subtle can't make a grand entrance under tow. The trip from outside the channel into the marina was complicated and at times infuriating. I'm not even sure I want to tell that part of the story. Nothing can diminish the fact that we made it. A couple of rusty sailors had crossed almost 75 miles of open water on the fifth largest lake in the world. We had survived more than 22 hours, overnight, just Bella and us against the elements. It was wonderful, it was amazing, and it is exactly what I have always wanted to do. Bella is surely a boat destined for great adventures!